The length of time that water can be safely stored depends on several factors such as the source of the water (municipal or well), and the type of storage container. Tap water can be safely stored up to six months under specific guidelines, and it is recommended to have a three-day supply of water at all times in case of emergency. Tap water can be safely stored up to six months. Water that is stored in a pitcher for daily drinking should be changed and the pitcher cleaned at least weekly. 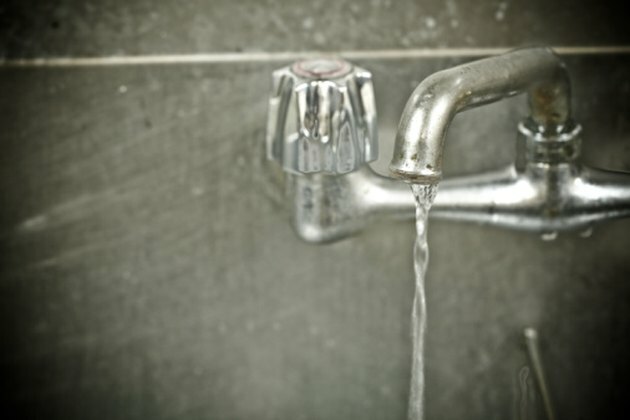 Municipal water is treated with chlorine, which prevents the growth of bacteria in water. Chlorine leaches out of the water and into the air when the container is open, so after a few days, the chlorine may be gone, opening the door for bacterial growth. When kept in adequate containers that have been treated for water storage, tap water can be stored up to six months. The best idea is to use food-grade water containers, which can be found at camping or outdoors stores, as well as many grocery stores. If you decide to use recycled containers, choose plastic water jugs or 2-liter soda bottles. Avoid jugs that have held milk or juice, as they cannot be adequately cleaned and provide a breeding ground for bacterial growth. Containers must be washed thoroughly, as well as sanitized, for safe long-term storage. Sanitize by mixing a teaspoon of bleach with a quart of hot water and swishing the mixture around inside the container. Rinse out this mixture before filling with water. Municipal (city) water has been treated already, and doesn't require additional measures. Well water, or other water sources, should be treated by adding two drops of household bleach per 2-liter bottle of water. Storage containers should be closed tightly with their original cap, and labeled with their fill date. This emergency supply should be changed after six months of storage. Water can be kept in the refrigerator, or if there is not adequate space, jugs can be kept in another cool, dark place such as a basement or closet. For a three-day supply, it is recommended to keep 1 gallon of water per person, per day. Can I Drink Tap Water After an Earthquake?